Starting school is a milestone in the life of your child – and you. We do what we can to make the start of school as smooth and as exciting as possible. We have strong links with three local pre-school nurseries and often invite these children into the school through the year so that they can become familiar with us. Bagshot Pre-School operates from the Methodist Church on the London Road Bagshot. Find out more on the Bagshot Pre-School website. The Little Echoes Nursery is in Connaught Park in Bagshot. Find out more on the Little Echoes Nursery website. Before the children start school, we arrange for them to visit us in the summer term to meet their teacher and spend time in their new classroom. It’s important for them to know what they’ll be doing and where they will be going on their first day in September. 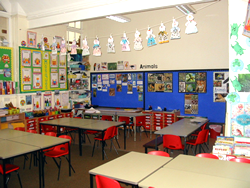 When it’s time for your child to move on to junior school, again we spend time working with the local junior schools to make the move trouble-free. Most of our children move on to Connaught Junior School in Bagshot and during their time with us, they will have been involved in trips to Connaught or have met some of the pupils of Connaught as they visit us to help out.